RALEIGH, N.C. — It’s a moment every year that shows March Madness has arrived: players on bubble teams nervously waiting to find out whether they’ve earned a spot in the NCAA Tournament. Their conferences wait, too, salivating at the financial jolt that comes when the right names pop up in the bracket — and maybe even make a run. A minimum of $10 million is at stake each year for the leagues chasing one of the last four at-large bids in the tournament, according to an Associated Press analysis of the NCAA system that pays conferences based on tournament performance. Those teams that end up on the right side of the bubble have generated at least $110 million for their conferences since 2011, when the tournament field expanded to 68 teams. Those fringe additions to the tournament represent valuable lottery tickets for smaller conferences. All it takes is one good run to pay off big, delivering windfalls of millions over six years for leagues that can’t depend on lucrative TV deals or lots of teams in the tournament year after year. But much like the rest of the system that has paid out more than $3 billion since 1997, the five most powerful conferences command a big share of the last invitations to March Madness. The overall system is used to compensate leagues for their teams’ tournament performances. The leagues in turn typically share those payouts among their member schools to invest back into their programs, though not to directly pay the athletes — who receive scholarships, not salaries. Since the NCAA expanded to four play-in games in 2011, Power Five leagues — the Atlantic Coast, the Big 12, the Big Ten, the Pac-12 and Southeastern conferences — have claimed more than 44 percent of at-large bids in the First Four, the two-day appetizer that feeds into the tournament’s round of 64. The rest of the bids have been spread among 11 conferences. The money has split similarly, with power conferences generating more than $49 million because of the First Four, including future payments. The Pac-12 leads all conferences with $14.9 million, with the ACC just behind at $14.7 million and the SEC generating $11.4 million. It’s hard to see small conferences catching up. The top four seeds of the National Invitation Tournament, generally representing the best teams left out of the NCAA Tournament, have pulled heavily from the power conferences, too, leaving little room for small programs to have a realistic shot of cashing in on an NCAA bid. That makes the stakes, and the financial upside, even higher for those leagues once they earn a spot in a very winnable game. The First Four games, which also feature automatic qualifiers from tiny conferences, match up teams with similar tournament profiles as they try to play their way into the main bracket. The NCAA payout for these games (here’s an explainer on how the system works) is exactly the same as any other win leading to the Final Four — at least $1.69 million for games in the 2019 tournament. While an extra game isn’t appealing for teams on a purely competitive level, the money upside is better for conferences than what can be expected from being a sure underdog to a No. 4, 5 or 6 seed in the round of 64. VCU maxed out its upside with its surprise run to the Final Four in 2011, which the Rams started with a play-in game as a No. 11 seed. Its five wins along with the appearance payout totaled more than $9.1 million over the next six years for the Colonial Athletic Association, continuing even after VCU left for the Atlantic 10 two seasons later. The Ohio Valley Conference offers this year’s best example for how much financial fortunes can sway when a team ends up on the right side of the bubble. Belmont earned an at-large bid to join league champion Murray State in the field, giving the league two bids for the first time since 1987. 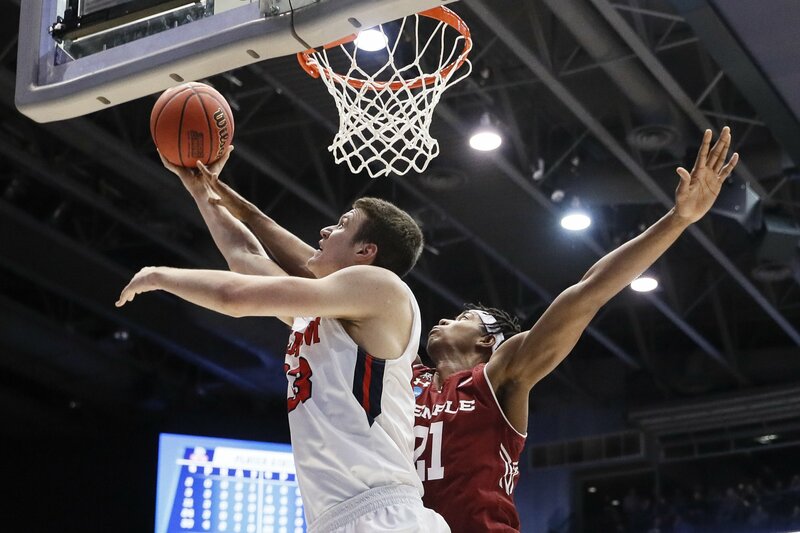 Belmont’s First Four appearance and its win against Temple, before falling to Maryland, amounted to at roughly $3.4 million for the OVC, spread over the next six years, with that amount likely increasing as the NCAA adjusts its payouts each year.